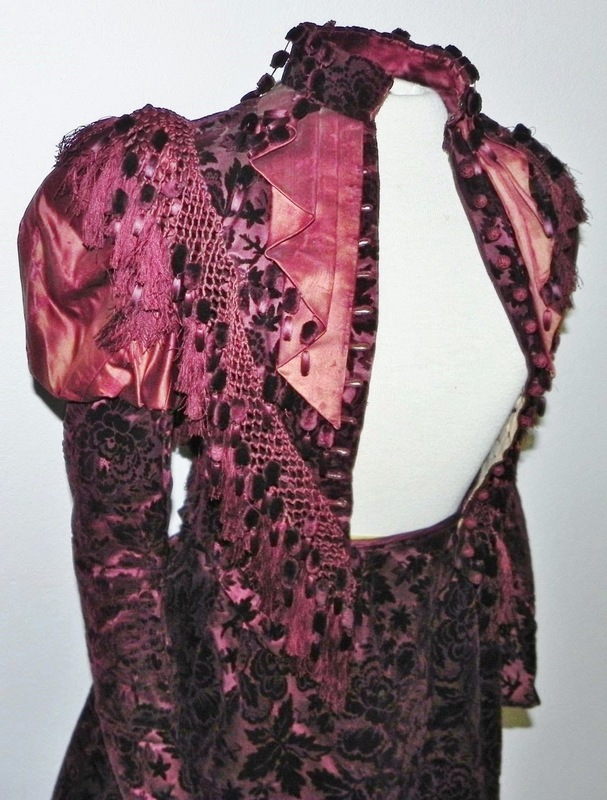 Exquisite, hard to find 3 piece Victorian set in exceptional, very wearable condition. 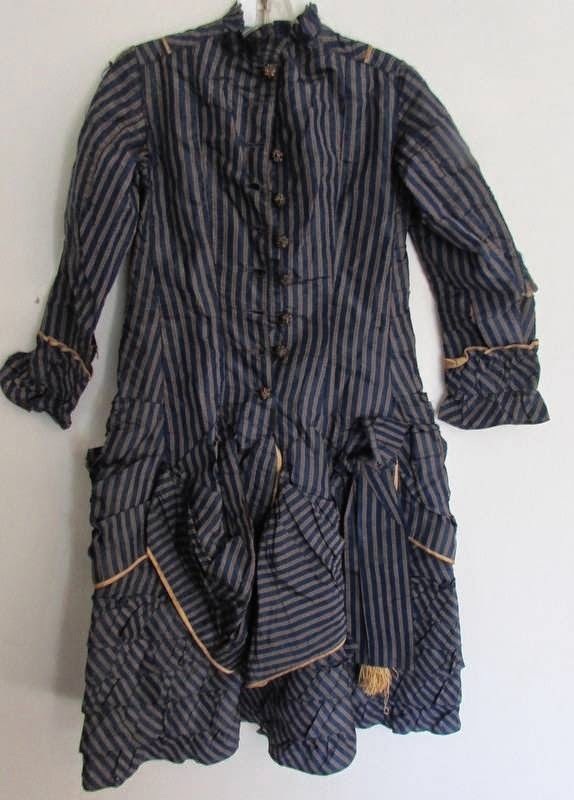 It's as close to brand new as you will ever find...a striking 1800's dress that may have come straight from the dress maker. 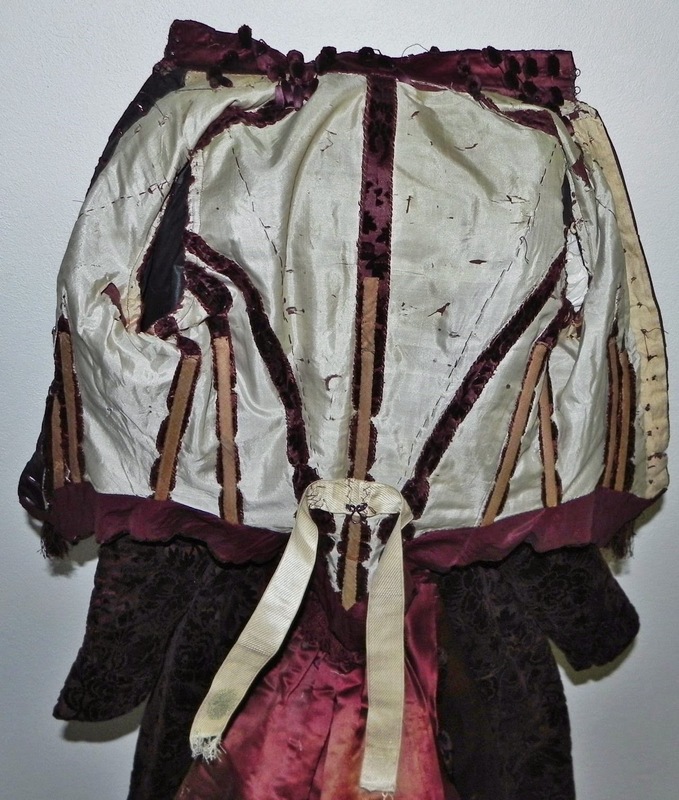 This matched set includes a fully finished corset jacket with pepblum front and high wrap collar, polished cotton under skirt with matching chintz hemline and the original bustle back over skirt with ruffled flounce. 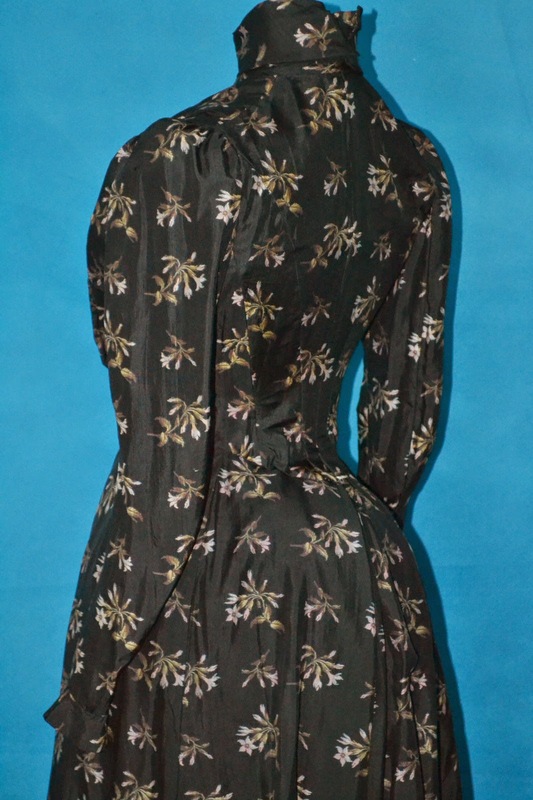 Gorgeous lilac colored floral print against striking black. 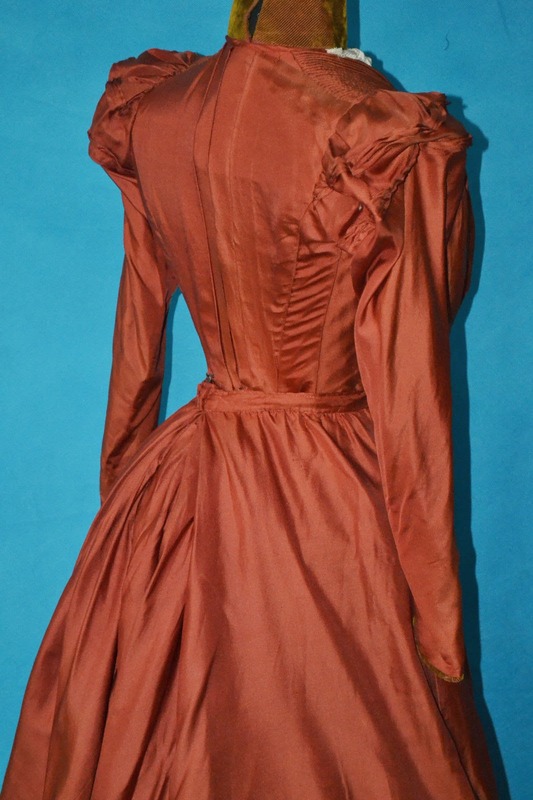 This genuine 1800's Victorian dress looks like it was never worn...clean as a whistle! 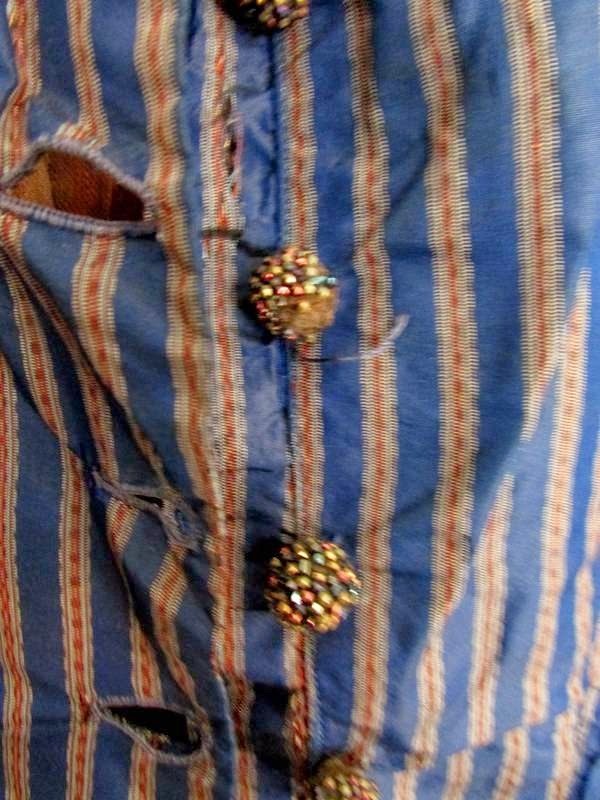 The only flaw you will find is a tear of the brown polished cotton waistband. 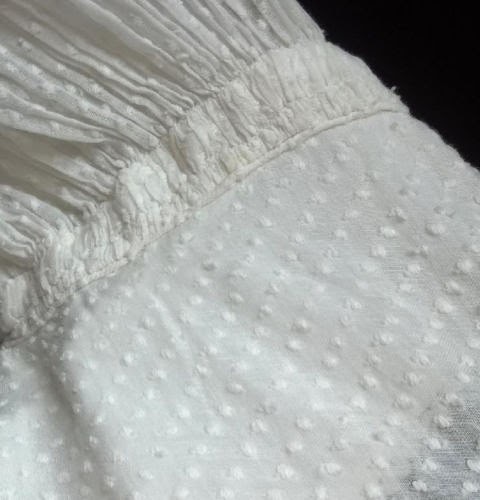 This was from improper hanging...as found...the weight of the skirt caused the tear. This is such a minimal flaw that some neatly darned stitches will easily mend. 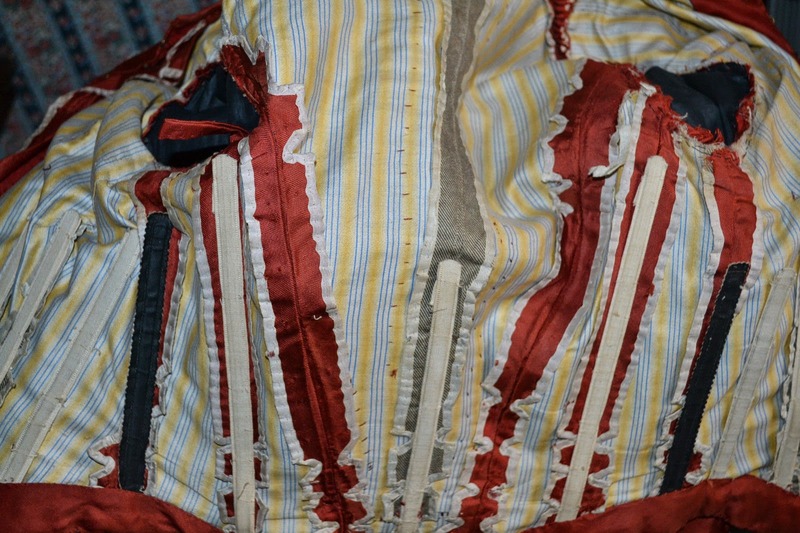 There are twelve corset stays sewn within the fitted bodice jacket. Early hook closure up the front with rare grommets. 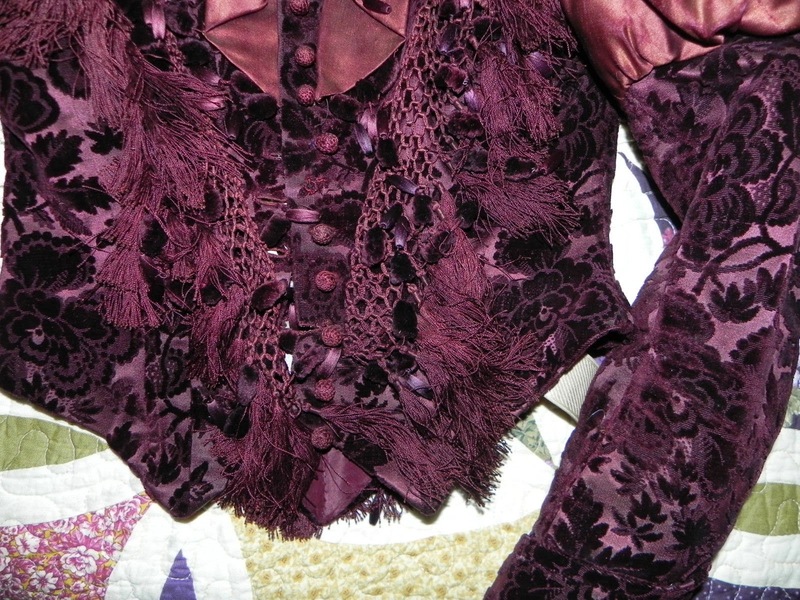 Exceptional finish work within the bodice lining. 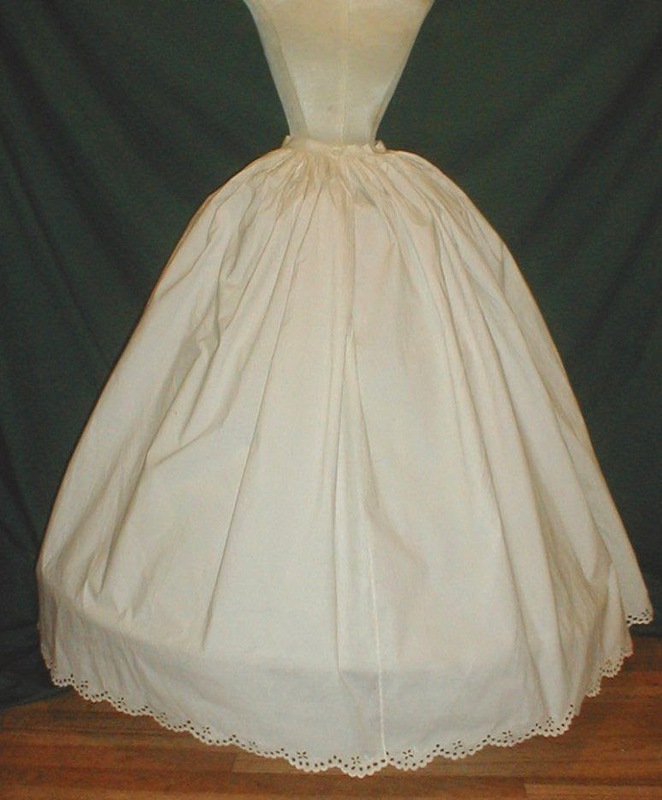 Full matching bustle back hoop skirt with tons of gathers and pleating in the rear. 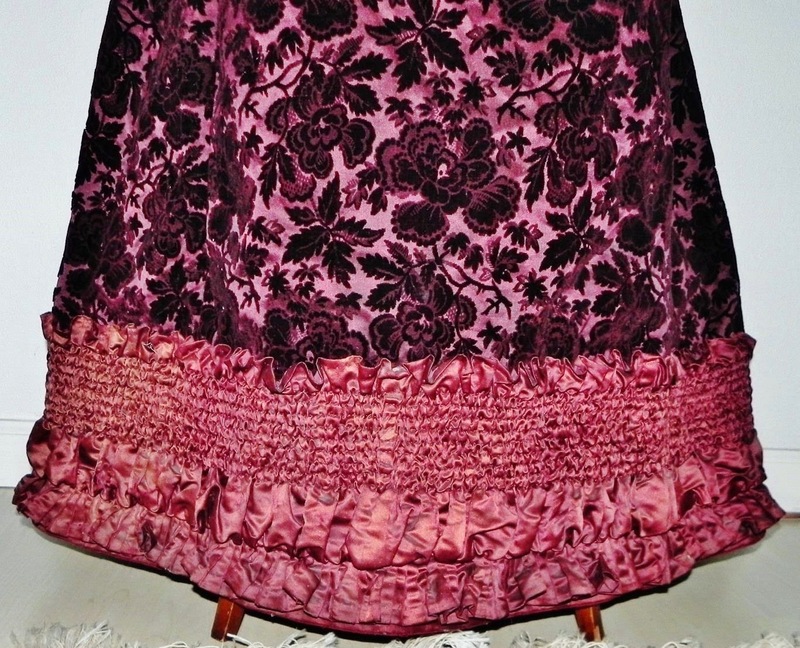 The skirt drapes nicely over the brown polished cotton crinoline liner with matching chintz hemline...the third in this beautiful trio. 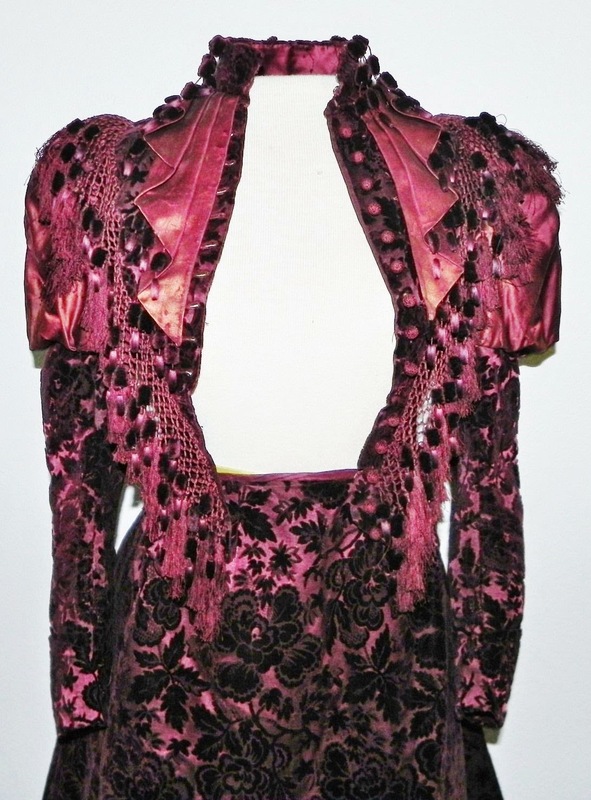 For serious antique clothing collectors, this is a must see. 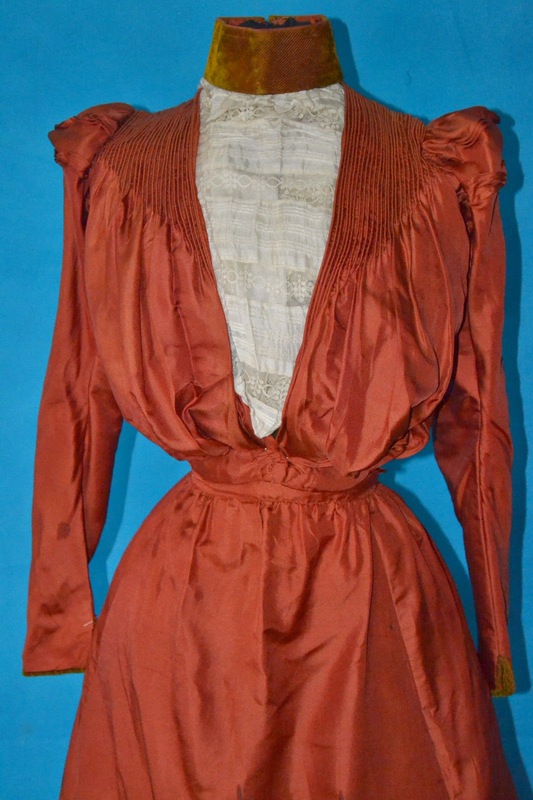 This is very wearable antique clothing. Please check measurements. 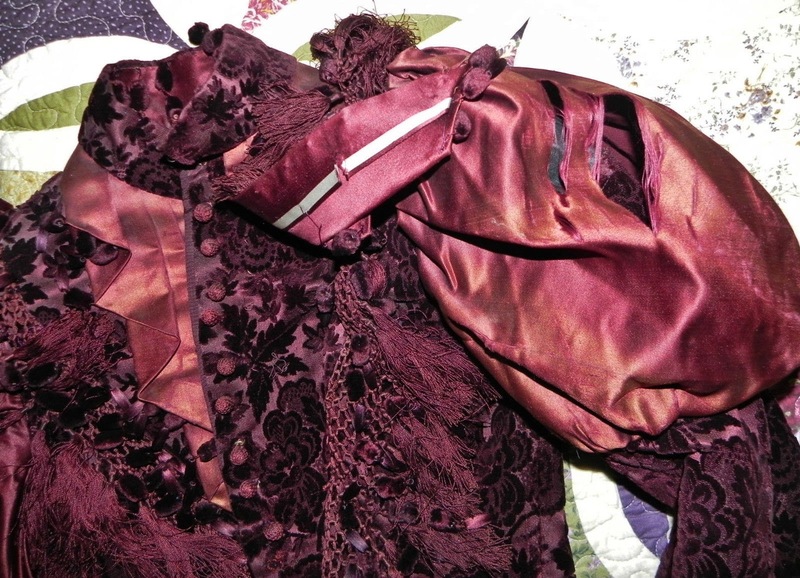 The corset jacket was quite tiny and would not hook closed on my dress form....see photos below. Feel free to make an offer...this will make a wonderful gift as it is in museum condition! 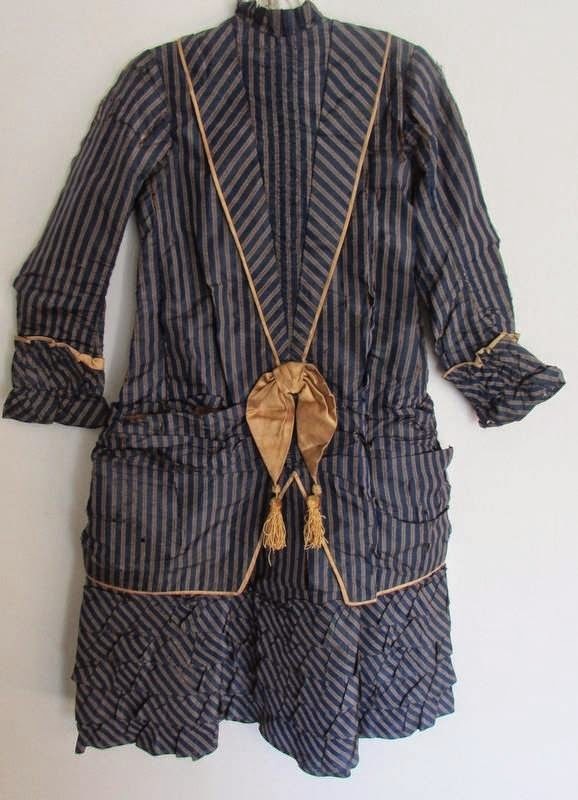 There is not such thing as wearable antique clothing, sorry. 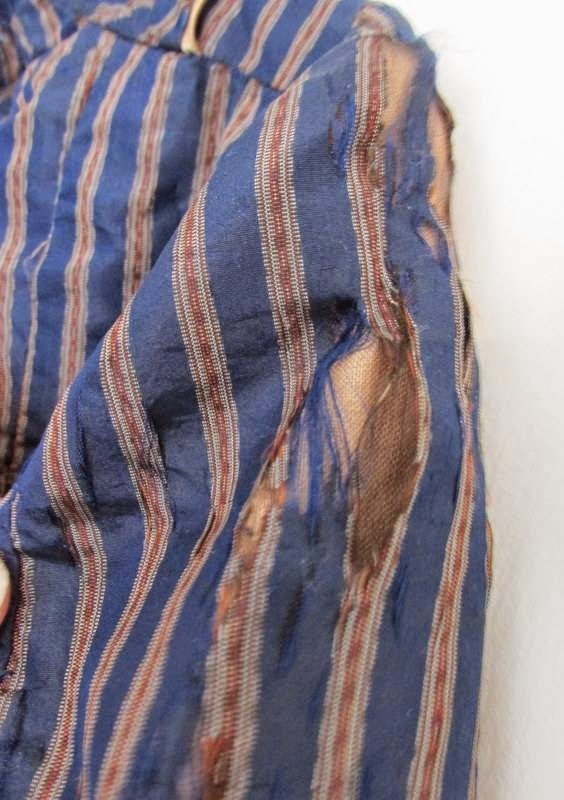 We've probably all done it at some point but we've all learned from that mistake as well - the fabric can't handle the movements any normal human will make anymore. It's antique! 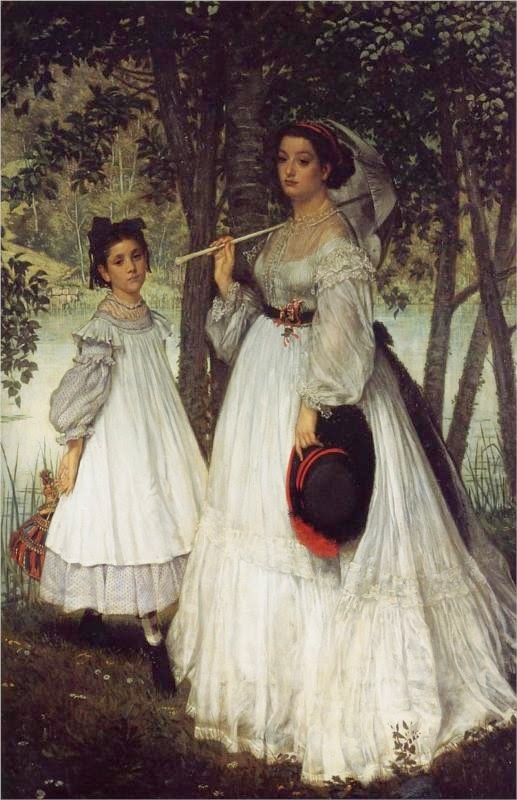 Anyway, it's not Victorian either. 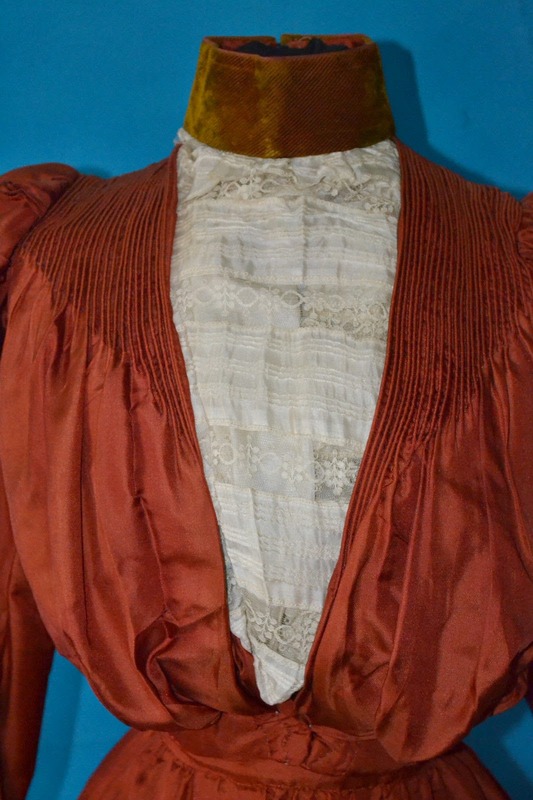 The outfit is Edwardian. 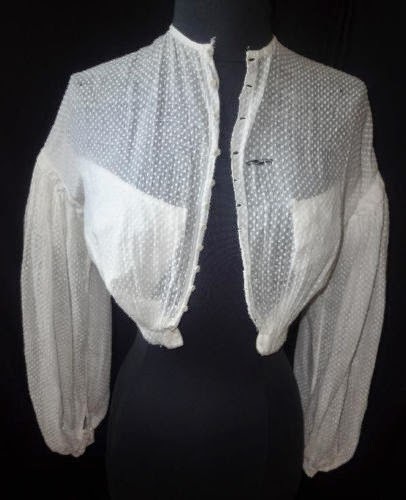 The pigeon front and sleeves give that away. 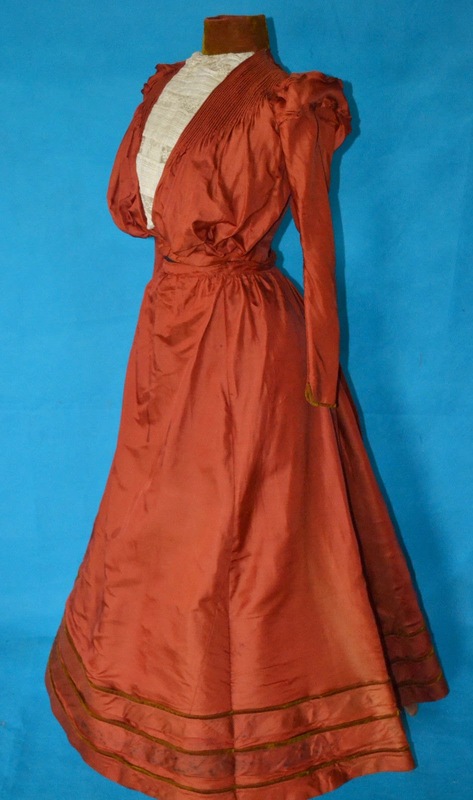 For serious Victorian clothing collectors, this is a must see bustle dress ! Anyway, this is from anywhere 1898-1901. 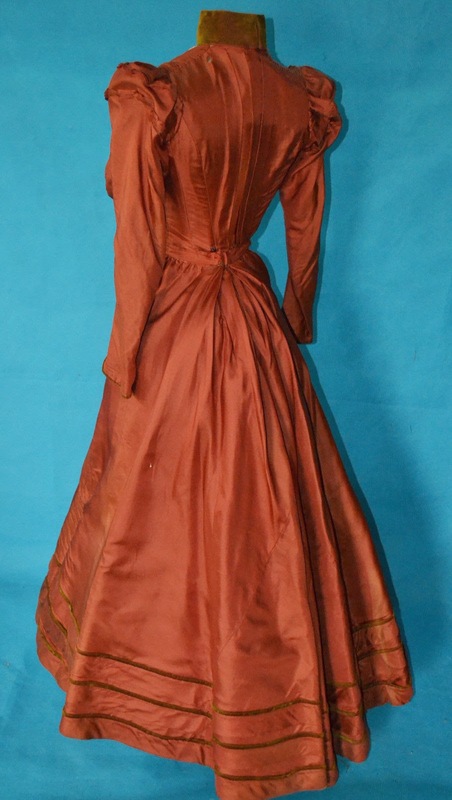 Very much a Turn of the Century dress. 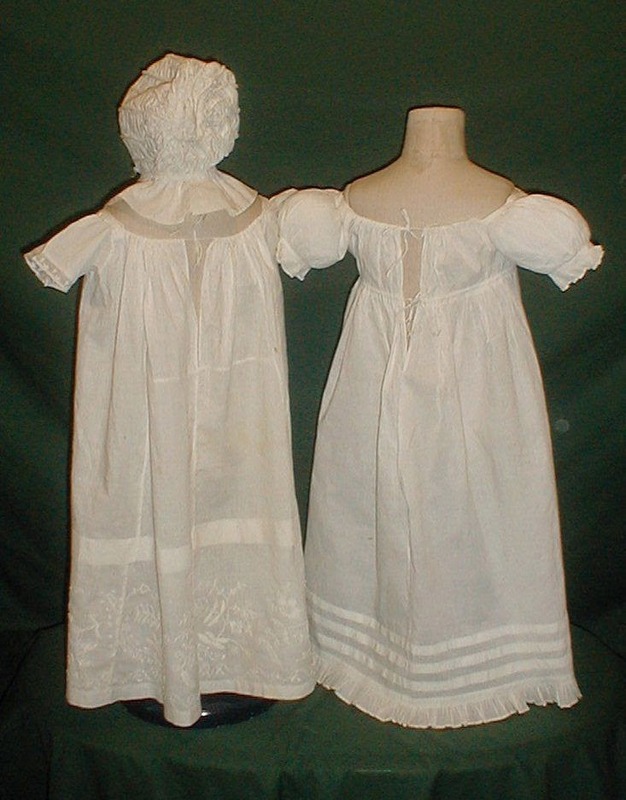 A very nice group of 1820’s cotton infant clothing. 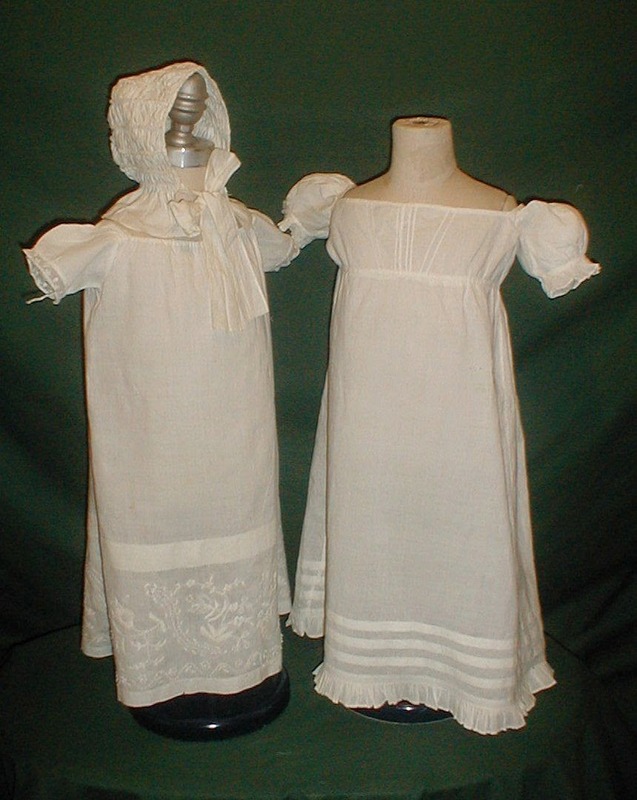 The group consists of two dresses and a corded bonnet. 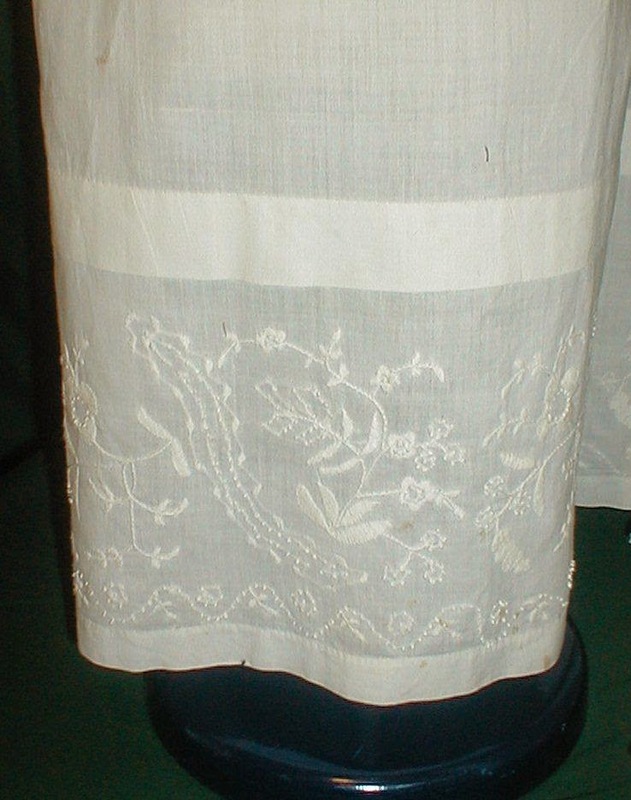 The first dress has an embroidered hemline. 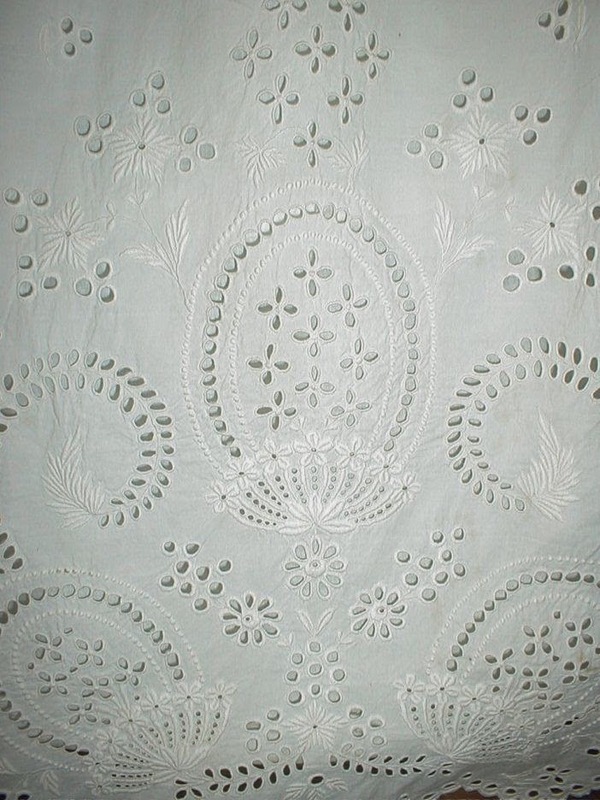 The embroidery is designed with satin stitching and French Knot stitching. 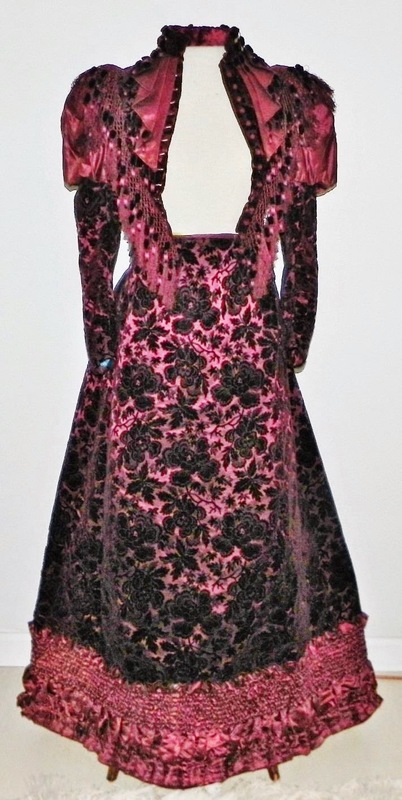 The dress has a drawstring neckline. Shoulders 8 Bust 22 Length 23. 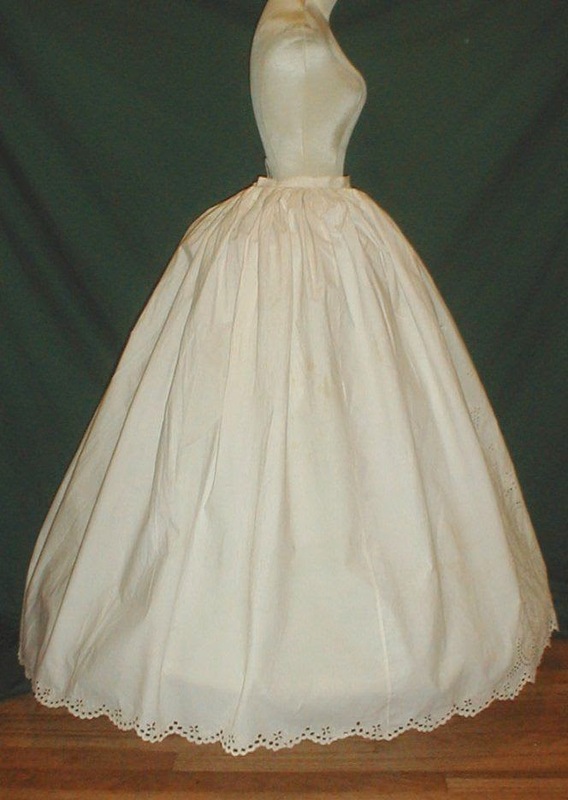 The second dress has a high Empire waist and pin tucking on the front of the bodice. 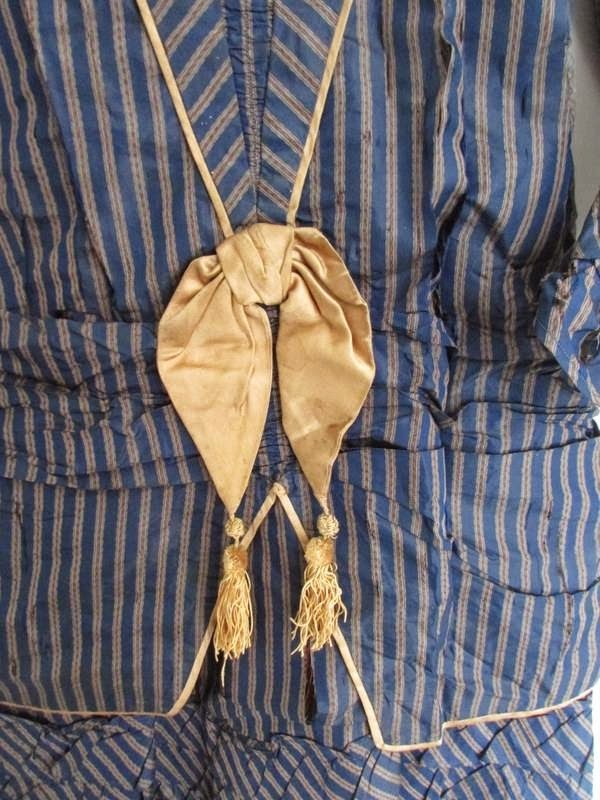 It has a drawstring closure at the back neck and waist. Shoulders 9 Bust 20 Length 25. 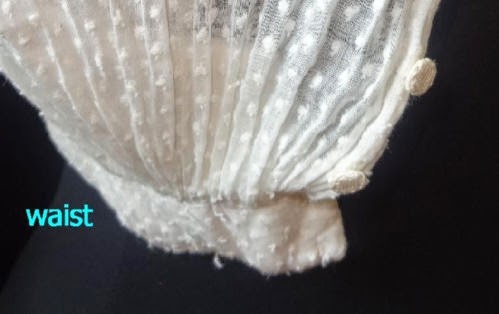 The bonnet is designed with padded cording that is intermingled with rows of ruching. 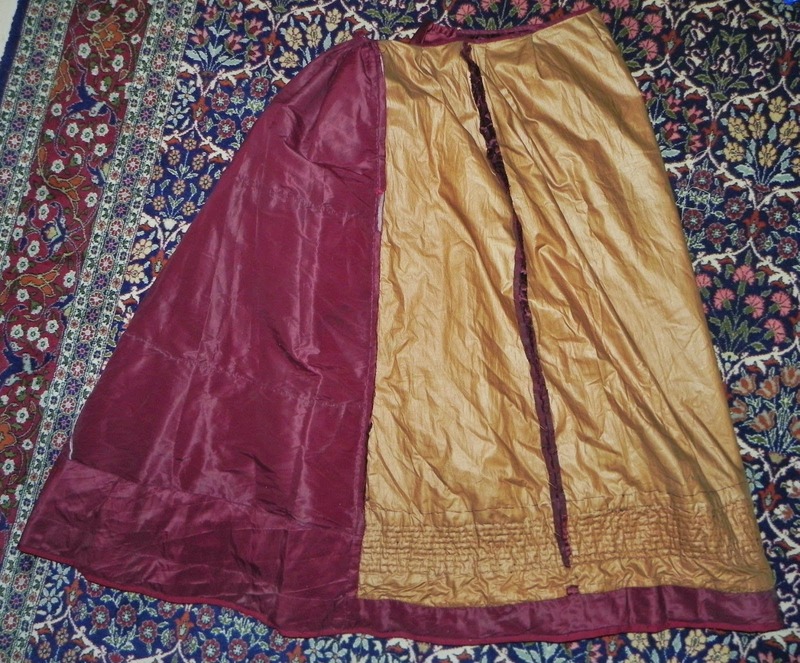 All of the garments are hand stitched. They are all in very good condition. 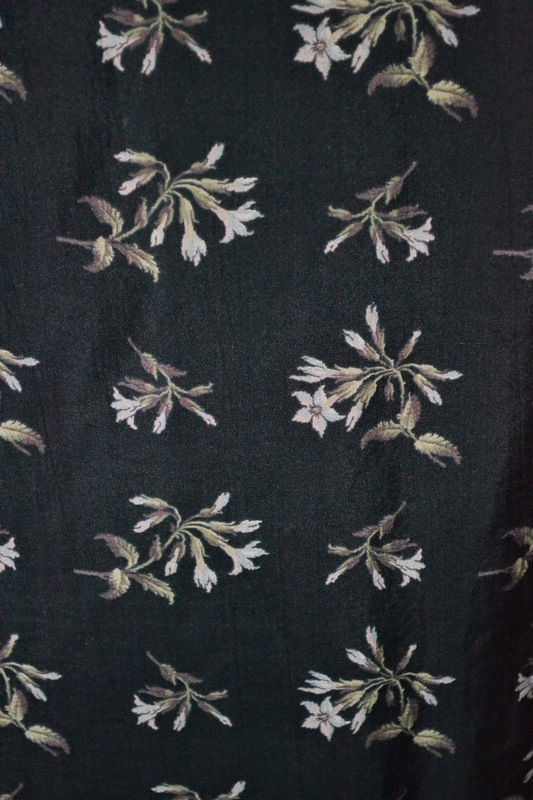 The embroidered dress has a couple of pencil tip size age spots and one slightly larger then pencil tip size period mend. 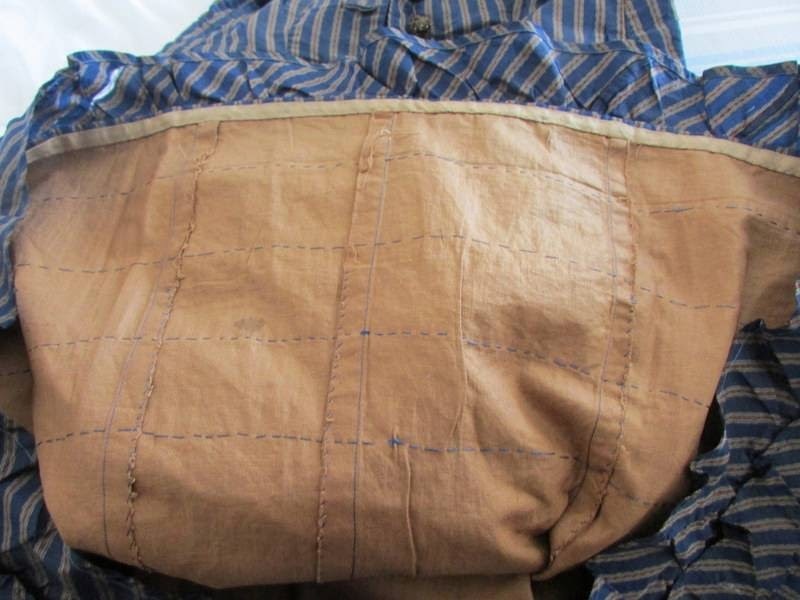 I think the pillowcase looking one is actually earlier - maybe 1800's. 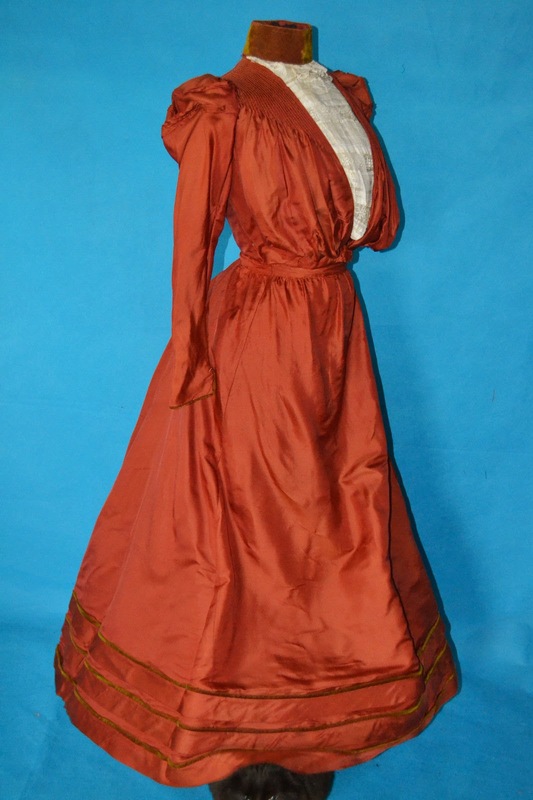 The Empire waist dress is from 1810's/1820's. 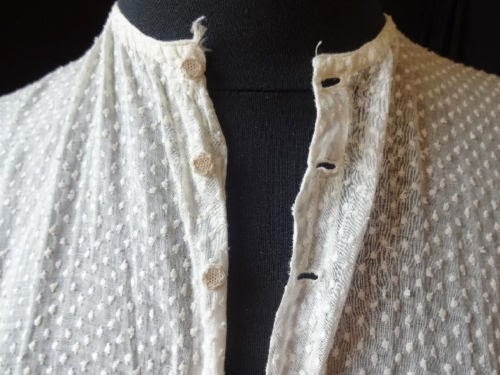 A very lovely original pre Victorian to early 1830s to early 1840s lady's 5 bone or baleen stayed bodice, completely meticulously hand created in dainty sheer white dotted swiss cotton fabric. Lots of wonderful detailing including the built in heavier weight cotton camisole that is edged with very narrow ric rac trim. 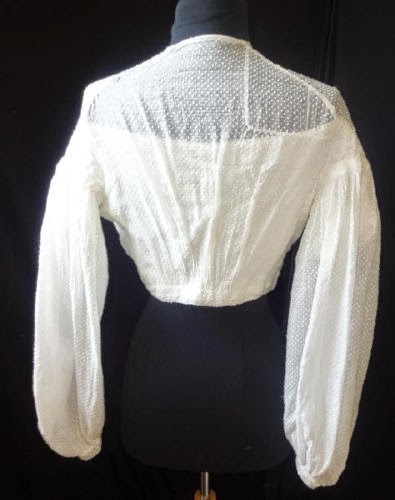 The drop shoulders are decorated with very tight ruching, (even tighter than typical cartridge pleats), very fashionable of the era billowing balloon sleeves that are cuffed with cartridge pleats and a tiny fabric w/ hand tatting covered button to match the delicate front buttons closure. 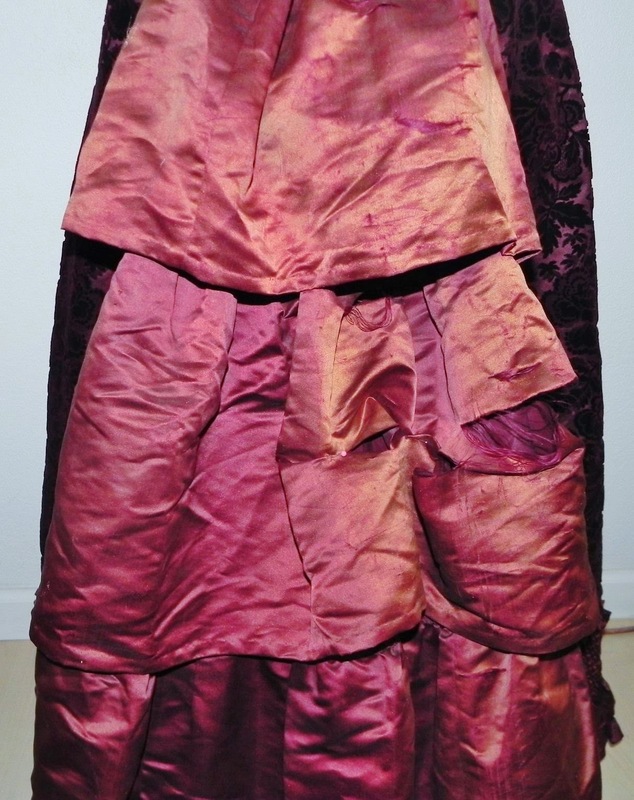 A higher Empire style waist that is completed with fan pleating flowing upwards toward the front bustline and in the back. Truly a superb example of the era. 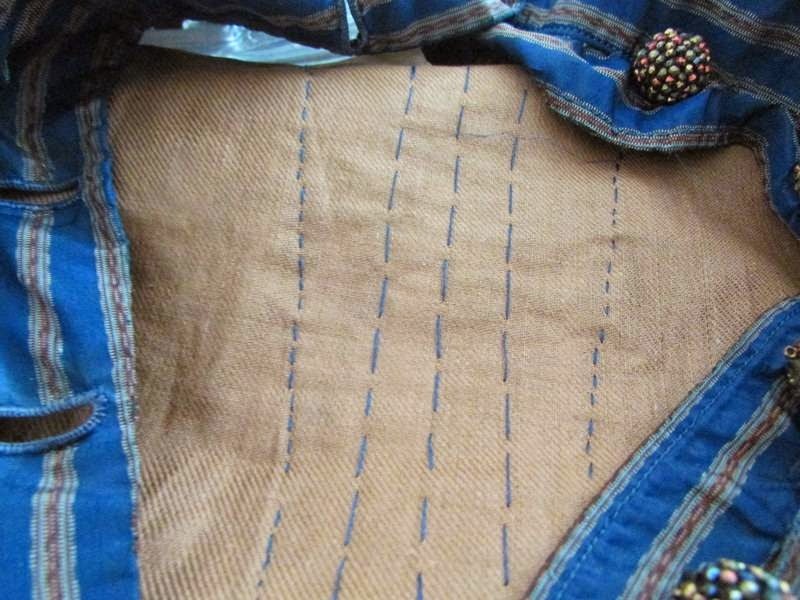 In overall very good condition, an opening in the front, a larger period patch repair in the back , a small opening in back at the nape of the neck and at a patch seam. Although I consider it to be in overall very good displayable and perfect for study condition, I am selling it as is. The bust is 32". I don't see fan pleating on this. 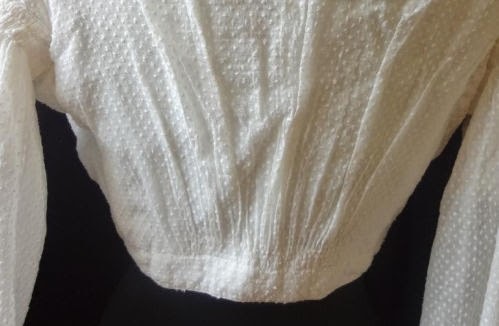 I get why the seller might think this is earlier than it is. 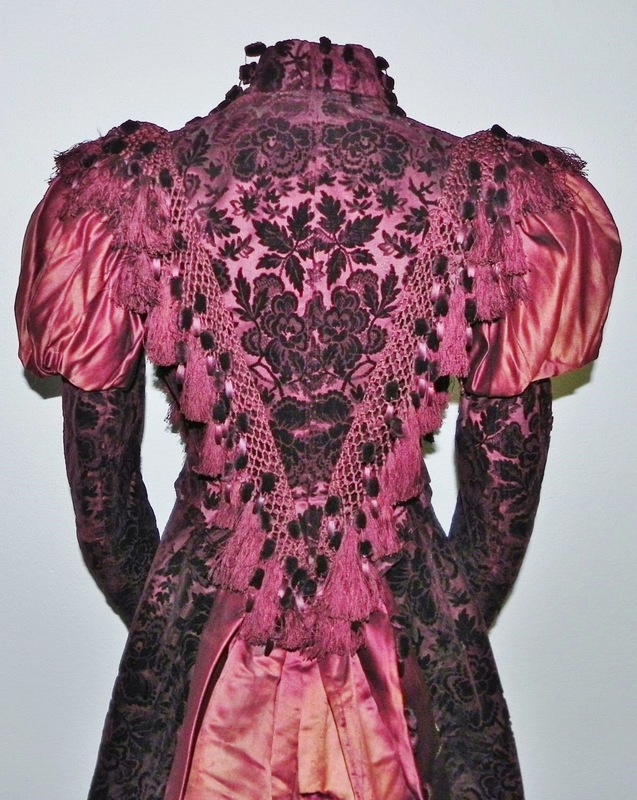 The waistline is very deceptive on late 1860's garments. 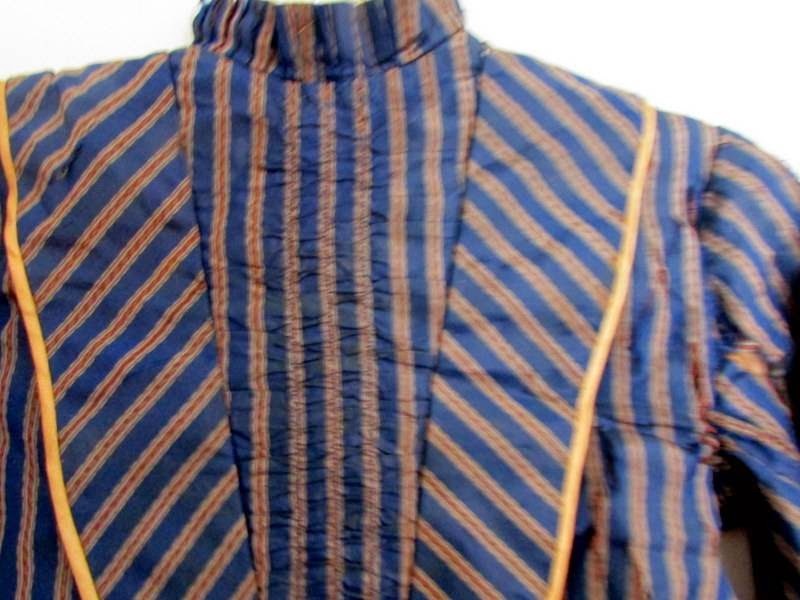 However, the waistline by the late 1830's/early 1840's reached normal or below normal lengths (some of those 1840's bodices are long). Also, although it existed in the Romantic era, Swiss Dot was all the rage in the 1860's. 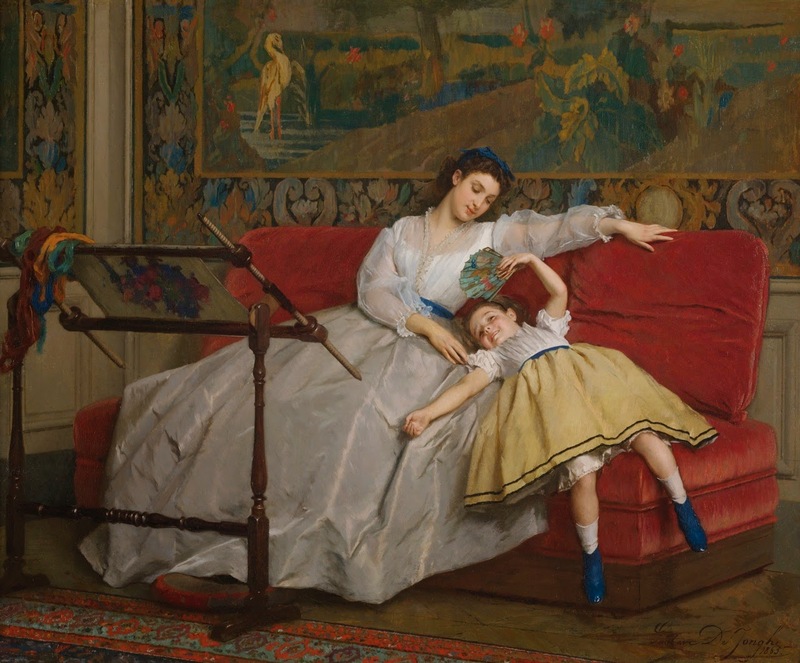 Plus, there are these paintings showing very similar blouses from the 1860's. 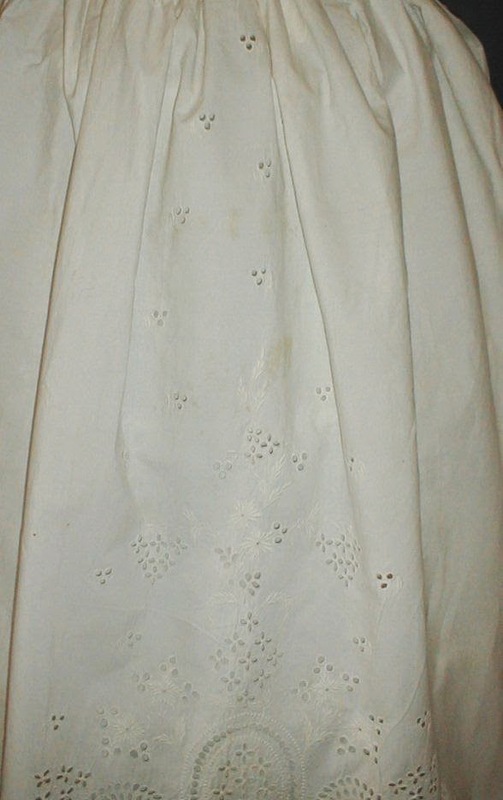 A beautiful 1860’s Civil War era cotton and eyelet petticoat that has recently been de-accessioned from a museum collection.. 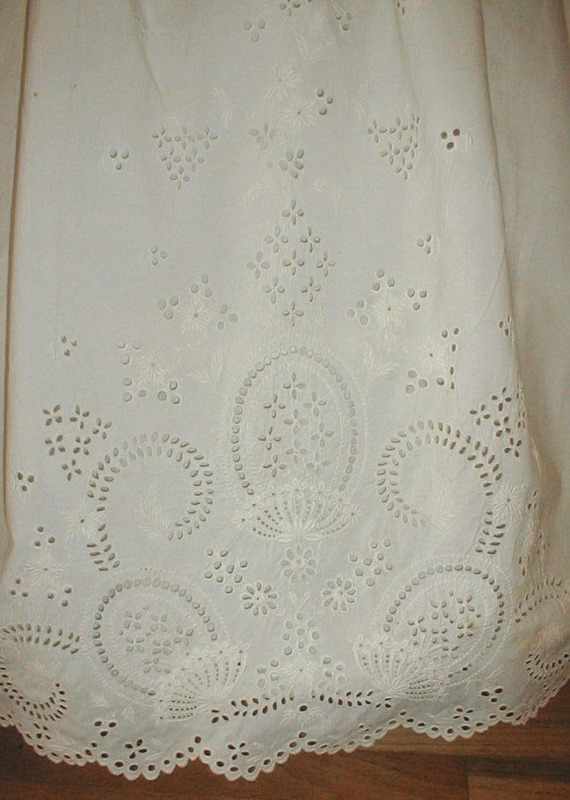 The front panel and the hemline are decorative with exquisite eyelet. 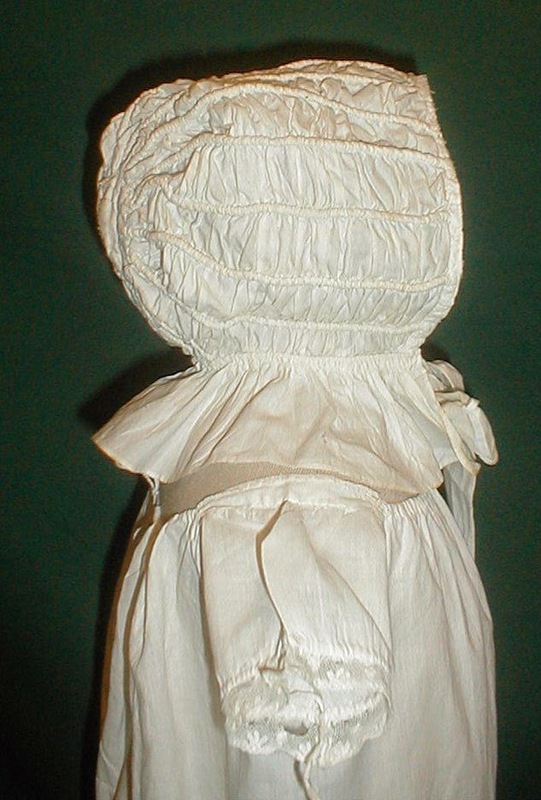 The petticoat has tight cartridge pleating at the waist. And a back button closure. It is in very good condition. There are no holes. There are a few areas of light age discoloration. A beautiful work of art. 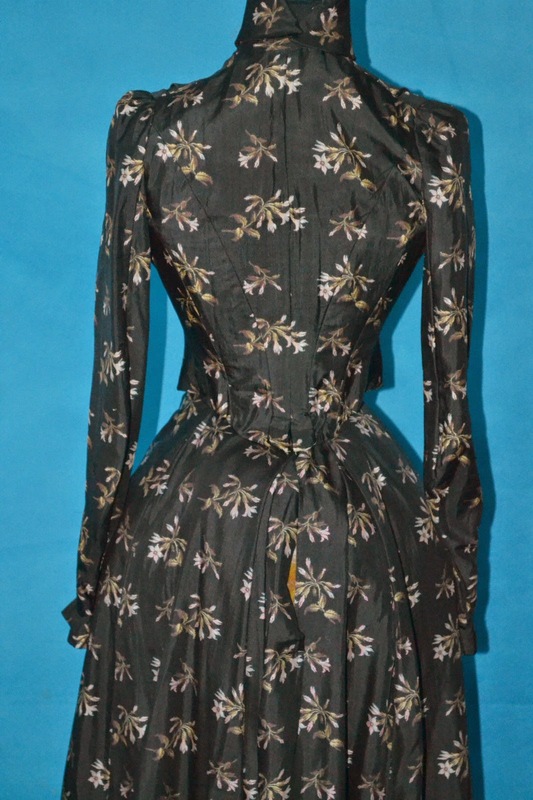 Waist 22 Length 38 Width at hemline 138. Probably for a front opening wrapper. 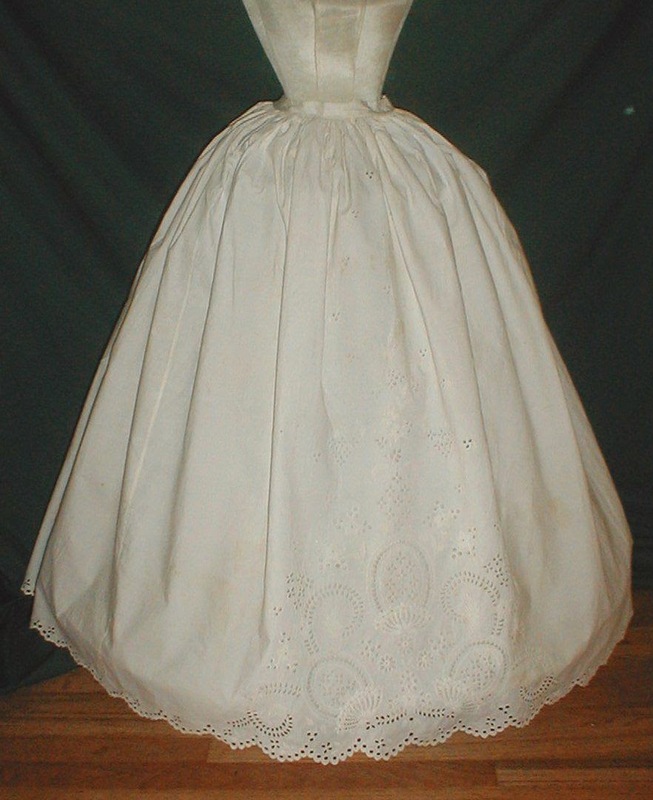 The petticoat front would have been visible beneath the dress/wrapper.